Introducing New Tile By Helmsman Salt Available Through SuperStrata. 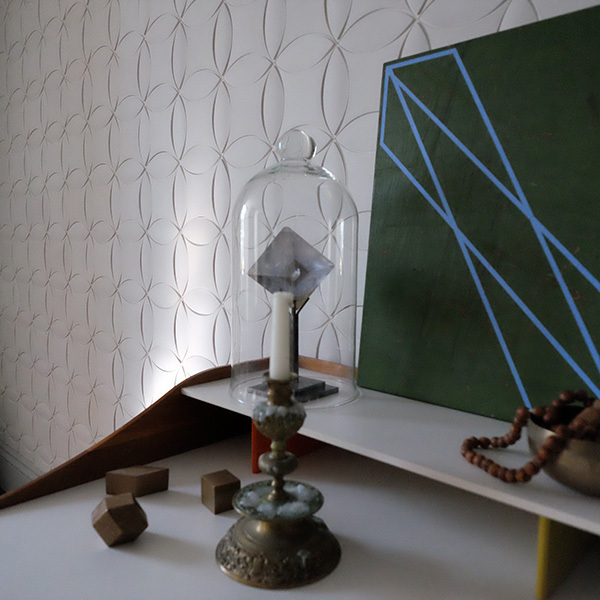 Designed and hand-cast right here in New York City, Helmsman Salt’s contoured, geometric plaster wall tile hearkens to traditions where tile is not only for kitchens and baths, but adorns living spaces as well. Available exclusively through SuperStrata, we are thrilled to share this exciting new tile with you. Left: Exterior of the Walker Tower. 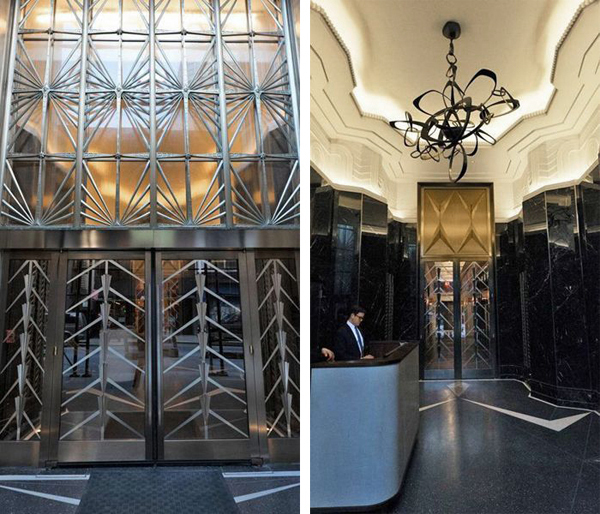 Right: Custom, modernized Art Deco friezes by SuperStrata top off the newly completed Walker Tower Lobby designed by Jarvis Studios. Called the “architect of the century” by the New York Times early on in his career, the legendary architect Ralph Walker completed his Art Deco masterpiece, lower Manhattan’s Walker Tower, in 1929. With the Walker Tower and his other Art Deco skyscrapers he sought to humanize skyscrapers through both design and ornamentation. Originally designed for the New York Telephone Company, today the Walker Tower has been converted into luxury residences with quite a pedigree . Walker’s original deco vision was painstakingly preserved during it’s conversion from office headquarters. This restored architectural masterpiece soars above its neighboring buildings, providing views of Manhattan that rival the beauty of the meticulously designed interior. 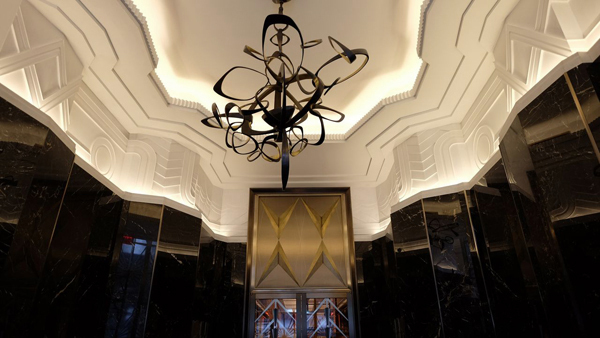 As part of that restoration SuperStrata was brought in to create the custom, hand-cast Art Deco inspired plaster panels that top the sleek, black marble lined lobby designed by Jarvis Studios. From design to fabrication and installation, creating the Walker Tower lobby friezes was an artistic pleasure at every stage. 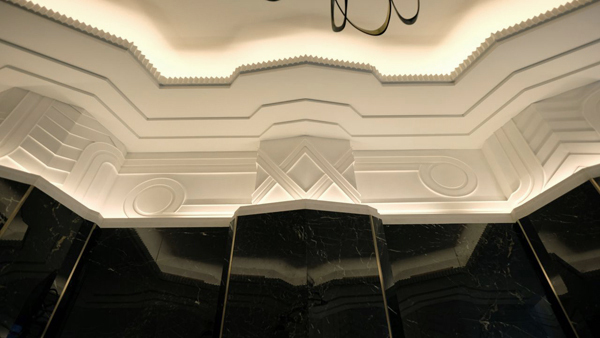 Custom, handmade plaster friezes by SuperStrata provide Deco adornment in the Walker Tower lobby. 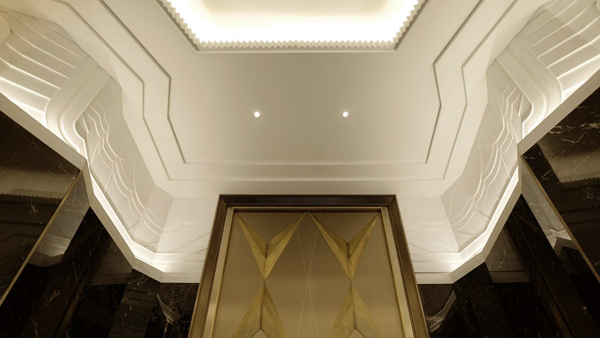 Deco flourishes – white custom plaster friezes by SuperStrata in the Walker Tower Lobby. White cast plaster friezes designed by SuperStrata for the Walker Tower Lobby top lush, black stone walls. 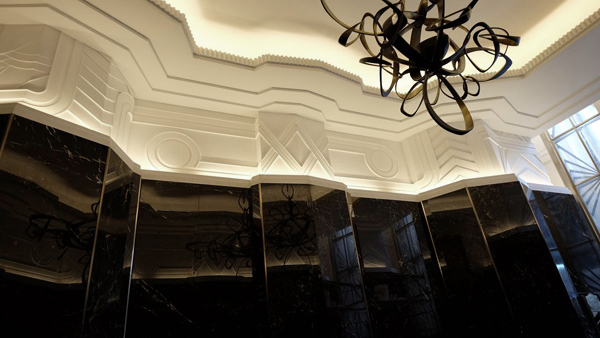 Contemporary, custom plaster friezes by SuperStrata integrated into the Art Deco concept in the Walker Tower Lobby. Cast plaster friezes by SuperStrata about to be installed in the Walker Tower Lobby. Interior, Furniture, and Accessories Designer Nicole Fuller is a lot like her interiors. At once exuberant, enchanting, and cosmopolitan, this hip sophisticate creates fresh, glamorous environments with just enough edge to surprise and captivate. And we should know, Nicole has been a favorite client of ours for many years. 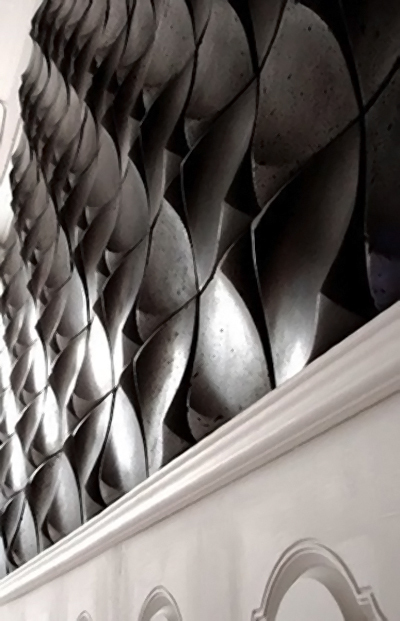 Beyond being a joy to work with, she is an innovative designer who always requests imaginative new bespoke wall and ceiling treatments from us and other artisans she works with. 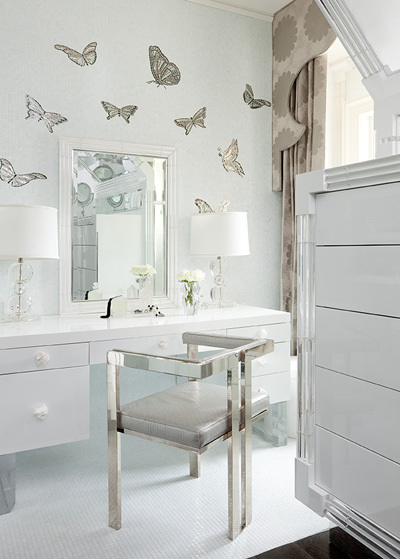 Never one to overlook or downplay any element in her interiors, she’ll often incorporate bold wallpaper or design something completely new for those surfaces; whether custom plaster finishes, bespoke wallpaper, fabric, leather or metal, yes metal, the walls in her interiors are an integral component that never disappoint. 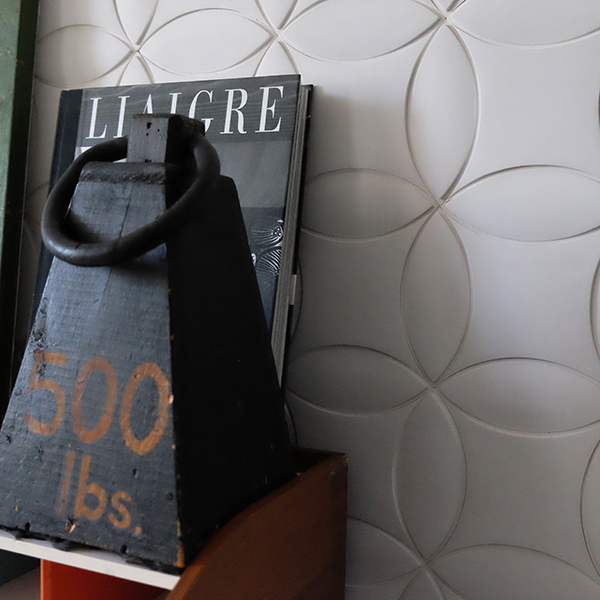 We asked Nicole to share her design process, idols, and favorite wall treatments with us. SS: You are a very detailed and involved interior designer and as you take every element of a room into consideration, at what point do the walls and ceiling come into your process? NF: I consider them right from the beginning. The walls and ceiling envelope a space and are what initially inspire my creative process. They play a crucial role in the creation and direction of my designs. Walls and ceilings have the ability to either develop the pre-existing features in a space or even change the space entirely. You can also really play with spatial perception of a room just by referring to its walls and ceiling. SS: Walls and ceilings in your designs are always an integral component. Beyond that, they are often really dynamic surfaces- fresh, inventive, and bold. Considering that wall finishes and treatments in contemporary design offer innumerable possibilities, what is your process in arriving at the final treatment for those surfaces? NF: I like to learn and understand the age and character of the building that I am designing within. The intended emotion and ambiance in a specific space helps to define and clarify the creative process. My wall and ceiling creations often go hand in hand with the furnishings I am thinking of putting in the space, and building that initial relationship between actual pieces of furniture and what is either going on the wall or ceiling is vital. SS: What challenges have you faced when designing for walls? NF: More often than not, the issue is technical versus creative: uneven walls, poorly constructed buildings, and of course, low ceilings, are always a challenge that we look forward to finding a novel solution. I don’t really see any barriers as a negative but more as a challenge, and even the toughest situations excite me and push me to be more aggressive creatively. 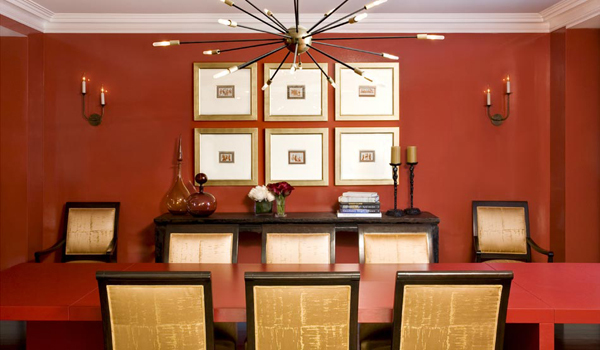 It’s funny – clients typically resist wall covering at first. They only think about their grandmother’s flower paper. 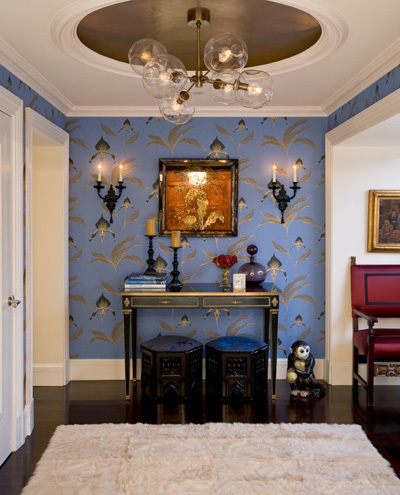 I have always used wallpaper and treatments in all my interiors. 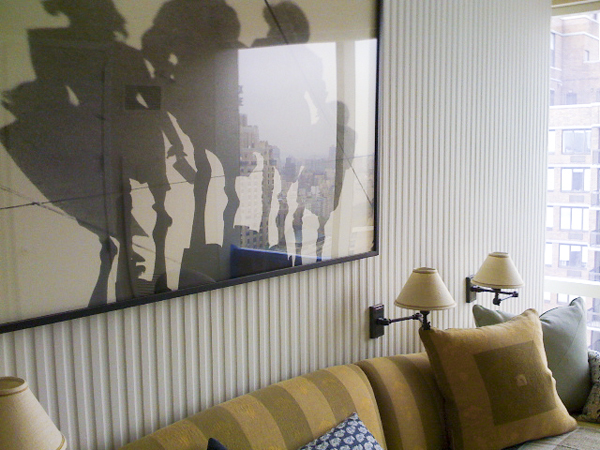 Wallpapers and treatments can reference history while simultaneously providing a compelling modern flair. NF: I guess I would have to say Vampire’s Garden. It’s one that I designed. It’s distressed leather wall panels with abstract floral tattooed in pure mineral pigments. As with all our creations this treatment is fully customizable. SS: What about in another designer’s project? 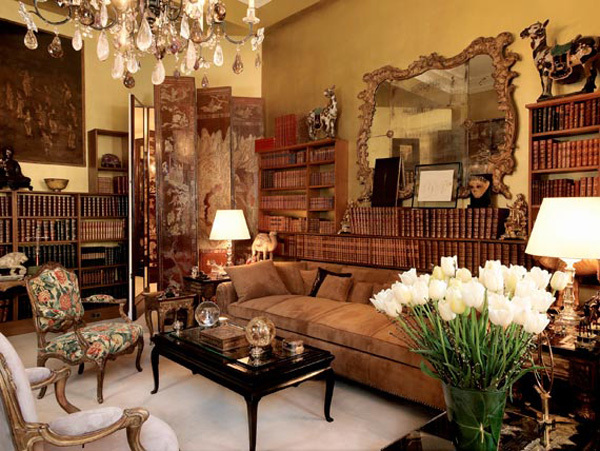 NF: I’m obsessed with Coco Chanel’s famous apartment in Paris, France. Not only was she brilliantly talented transforming the fashion industry, but also her interior design skills were perfection. She continues to be a true inspiration. 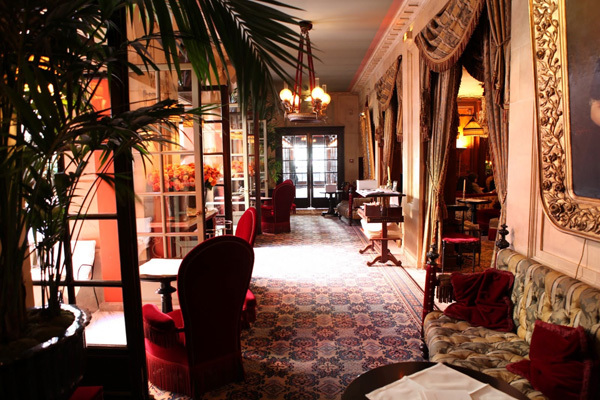 I also adore Hotel Costes, designed by Jacques Garcia in Paris. It displays such imagination brought together by beautiful wall treatments and textures. Also Yves Saint Laurent’s apartment in Paris, designed by Jean-Michel Frank is a favorite. The apartment is masterfully designed with the perfect pairing of new and old pieces. SS: As a style trend-setter, are there any new products or processes that you’ve begun using recently? What trends are you seeing with regards to wall treatments more generally? NF: I think metal on the wall is going to be the next big thing – applied, inlayed, and painted. Metal is inherently dimensional – you can’t go wrong. We have recently started designing a burnished bronze geometric design on large panels for a client. I can’t wait to see them in place! I’m mixing in all different metal leaves (gold leaf, silver leaf, etc.) as well in my treatments. Stay tuned… I’ll be sending out sneak peek pictures through twitter at @NicoleFullerInt. SS: As a designer, you create not only interiors, but also design individual elements that make up those interiors, such as furniture, lighting, and bespoke wall treatments. Where do you find your inspiration? NF: Lately I’ve been inspired by vintage Van Cleef and Arpels jewelry. I recently went to a private showing and the shapes and color interacting just-so with the precious metals immediately made me think of a whole new concept for pieces of furniture. It’s not surprising that Nicole is inspired by the baubles of the Van Cleef and Arpels. Just like those jewels juxtaposed just-so within their precious settings, the elements in one of her interiors are perfectly paired with their surroundings. For more interior design inspiration see check out Nicole’s work on her Website. 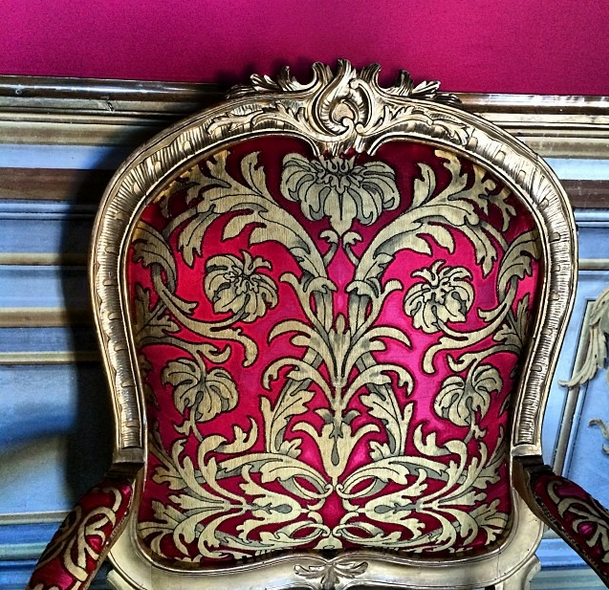 To see Nicole’s furniture and accessories, check out her collection, Isabella Wolfe. All photos courtesy of Nicole Fuller Interiors unless otherwise stated. Custom Authentic Polished Venetian Plaster by SuperStrata for Nicole Fuller Interiors. In the last few decades the polished Italian limestone plaster as luminous as a pearl has come to be known as Venetian Plaster. Driving its immense popularity is its undeniable beauty, but behind the accent walls there is a storm brewing. The tempest on the horizon of the design world could very well end the rein of Venetian Plaster as a “timeless” and “classic” wall treatment; the proliferation of badly done fakes by untrained “professionals” and “certified” painting contractors could render this once legendary finish a mere trend. In fact, many so-called “Venetian Plasters” that are installed today are the equivalent of buying Louis Vuitton bags on Canal St: they aren’t real; they aren’t natural; they aren’t quality; and they look like plastic! True Venetian Plaster and its resplendent aesthetic qualities can only be accomplished with real limestone plaster and great artisanal technique. 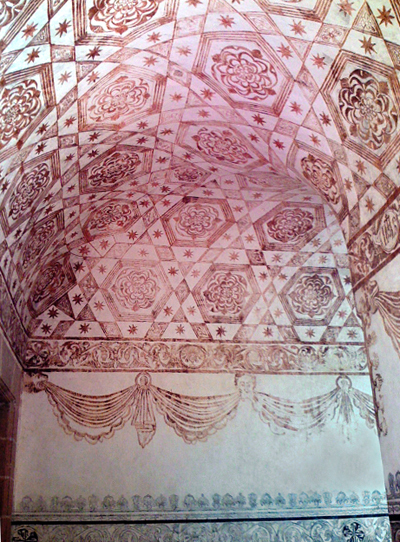 Authentic Venetian Plaster is made of slaked lime, marble dust, and water. As the plaster cures, it reabsorbs carbon dioxide from the air and returns to a stone state, strong and radiant with the depth of color and translucence of the natural stone that it is comprised of, limestone and marble. Custom authentic, polished Venetian Plaster walls with little color mottling in a modern mezzanine rivals lacquer for the title of queen of sheen. With the added bonus of being eco-friendly, the all natural plaster finish wins the crown every time. Interior design by Nicole Fuller Interiors. Walls by SuperStrata. Now you can buy a can of something labeled “Venetian Plaster” at Home Depot, but what is in the can is not Venetian Plaster. The proliferation of these canned imposters full of ethylene glycol, vinyl acetates, acrylics, and resins have turned these so-called Venetian Plasters into a cheap and shoddy commodity, chemically incapable of the depth of color, the play with light, and the longevity that the real thing naturally boasts. A true Venetian Plaster in a soothing natural tone lends tranquility and a spa-like quality to this master bath. Interior Design by Nicole Fuller Interiors. Wall Finish by SuperStrata. As pretty as a pearl, a classic wall treatment when paired with non-traditional fixtures and contemporary art make this bath stylish, luxurious, and grounded. Interior Design by Nicole Fuller Interiors. Walls by SuperStrata. The high shine qualities of the Venetian Plaster wall finish are topped by a ceiling aglow with Marmorino plaster with Mica flakes. Interior Design by Nicole Fuller Interiors. 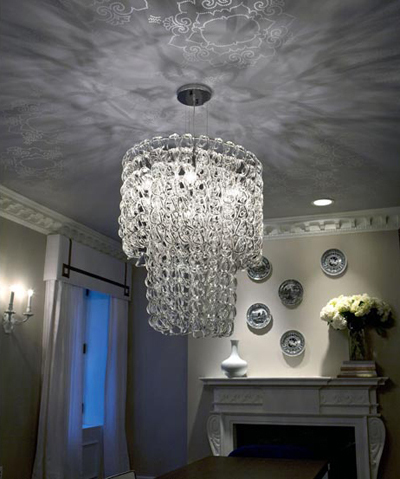 Walls and Ceiling Treatments by SuperStrata. 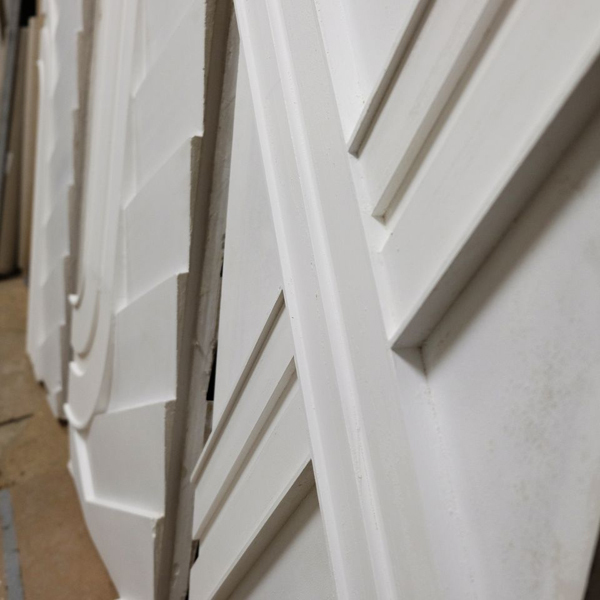 When installed as it was meant to be, with real materials, expertise, and craftsmanship, authentic Venetian Plaster is absolutely gorgeous, but when applied by untrained labor and contractors, the result is often inferior. This is doubly so when inauthentic and second-rate materials are employed to save on labor and cost. The old motto “you get what you pay for” is alive and well in the wall finishing business. Add the environmental benefits of using authentic limestone plasters to the equation, and the real thing always comes out on top. Walls are shelter. Walls are privacy. Walls keep things in and keep things out. We are surrounded by them, and when we are lucky, kept safe and warm by them. Walls are ubiquitous yet sometimes they are cursorily styled, not as an afterthought, but almost as a non-thought, something to merely hang a picture on. Other times they are works of art themselves, outstanding jewels that are perfectly suited to their environments. 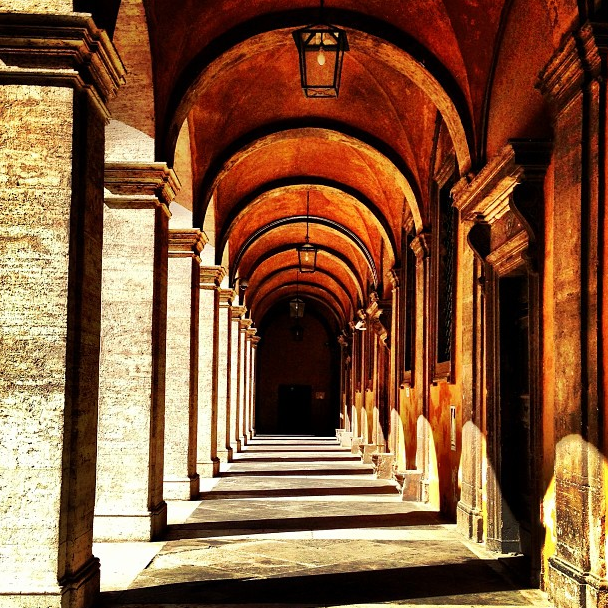 This blog is dedicated to those outstanding walls that surround us. 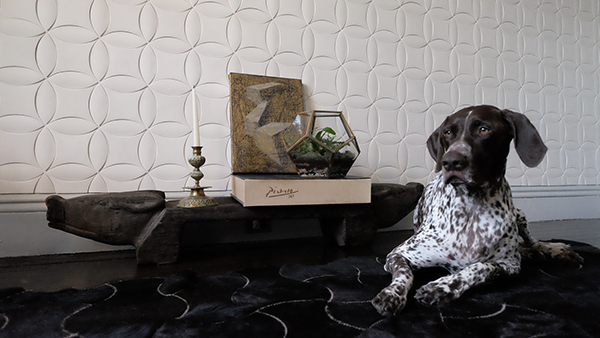 Chronicling our obsession, Walls Surround You profiles all things wall: plaster finishes, paint, design, tile, wallpaper, and of course, the fabulous producers, designers, architects, and decorators that create them. We will feature guest blog posts mixed in with our original content, projects, commentary, book reviews, and trend spotting. We are so excited to have you join us on our journey and to share our passion for the walls that surround us! A rough hewn plaster wall, resplendent with history supports a split spiral staircase from the 1939 World’s fair in artist Wharton Esherton’s home and studio in Valley Forge, Pennsylvania. There has been a surge of worn walls lately in the blogasphere, but this one in combination with the warmth of the idiosyncratic staircase and large wooden beam with a chair on top, is one of the most earnest we’ve seen. 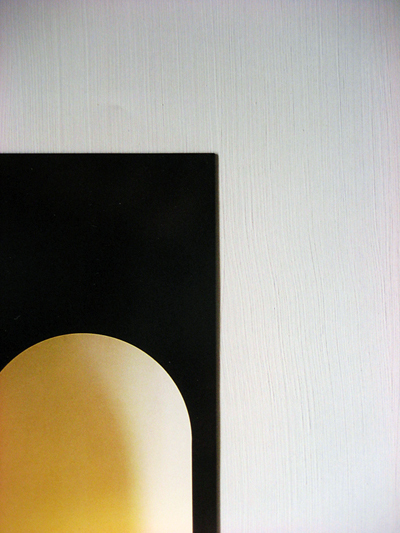 From a wonderful book that we recommend for design (and wall) inspiration, Handcrafted Modern: At Home With Mid-Century Designers by Leslie Williamson. Fabric covered wall with matching settee. Interior Design by Nicole Fuller Interiors. Photo via Nicole Fuller Interiors. 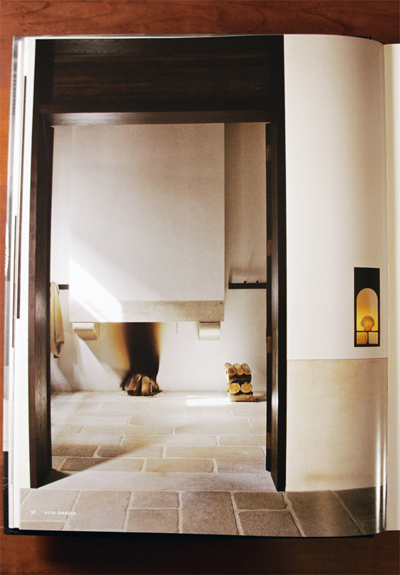 We had to include this entryway turned interior landscape by the former design duo Vessper Wilde. The settee is upholstered to blend into the fabric-covered wall almost seamlessly, creating the most glamorous camouflage we’ve ever seen. The oh so glam vignette is symmetrically flanked by hanging beaded glass light fixtures and walls of iridescent abalone shell tile. As a counterpoint, the soft, shag rug warms things up; plus, it’s the perfect contrast for the outcropping of black glass occasional tables that reflect the pattern of the fabric. It is not everyday we get to stretch our legs and work on a project like this one. 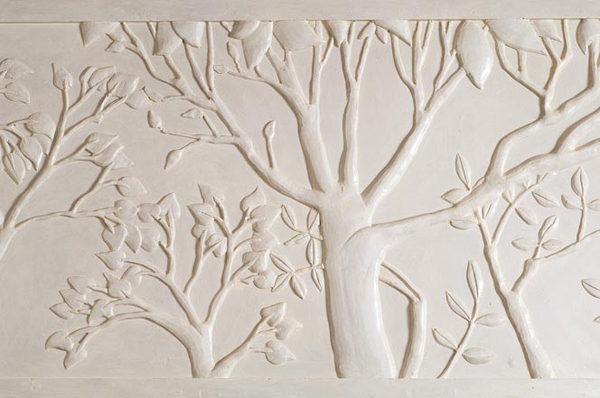 Sketched, hand-carved, and then cast by SuperStrata artisans, the detailed, custom plaster panels that abut the solid cherry wood walls were designed to bring the surrounding outdoors inside. Exposed beams, wood mantel, inviting furniture, antique church pew: together all of the elements create a comfortably elegant gathering spot. This photo was taken on vacation years ago in Mexico. We’ve long forgotten what town it was in, but we’ve never forgotten this work of traditional Mexican artistry. Unfortunately, we can’t give you too much detail, but we can share its visual splendor with you. 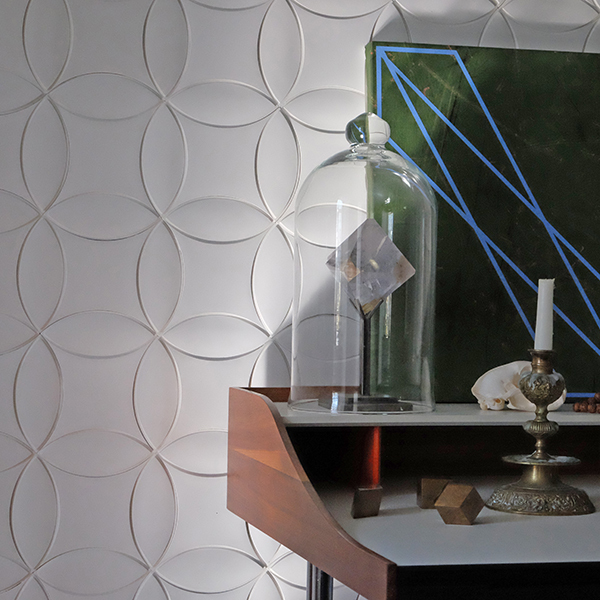 We’re imagining the geometric rosette design as a painted contemporary wall treatment. We love Liaigre! What’s not to love? He is so gifted, and we definitely appreciate his talent with walls. Not only two-toned, these walls are two-textured. Buffeting a warm toned limestone and marble dust plaster finish, Marmorino, or “little marble” in Italian, with a cool white lime paint in all of its gritty, brushy beauty is a textural feast for the eyes. Featuring this project and many more with walls that will make you swoon, Liaigre by Christian Liaigre is another must read for interior design devotees. Not your average Venetian Plaster, this fresh, custom yellow finish was executed without the mottling that many Venetian Plasters have; perfectly smooth, it has all the sheen and double the glory. It reminds us of that other high shine treatment, lacquer. However, unlike lacquer, an authentic limestone plaster wall treatment is eco-friendly, which makes us love it even more. 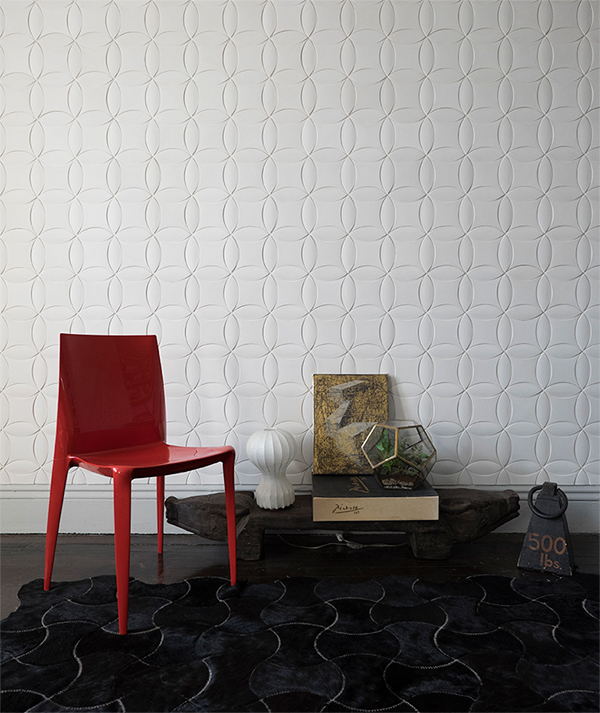 Dune, by Stephen Lindsay, is a contemporary shaped tile available in wood, concrete, and plaster. Abutting a bright white traditional wainscoting, the contrast of the organic inspired tiles is striking. 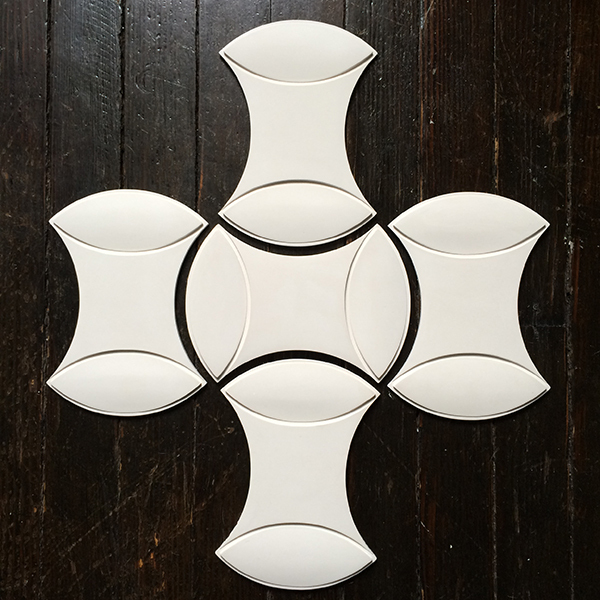 We are currently obsessed with tile designs that have a modulated surface, but we won’t get on our soap box yet, we have plenty of time for that! Speaking of time, choosing the images for our inaugural post was daunting- there is so much we wanted to share with you! In the end, all are outstanding examples of their individual styles. We’d love to know what you think!